Hooray!! It's finally available for everyone to look at! Thats right, the new catalogue can now be viewed online, just click on the picture of the catty in the right hand column and this will take you directly to the catalogue on the SU website. 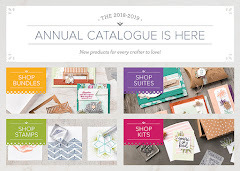 Now you can have a look for yourself at all the great new stamp sets, DSP and other new stuff. Of course to get a good look at the catalogue you need to be here tomorrow night or book a workshop and get your own copy free! If you wish to place an order or book a workshop just give me a call or send me an email.